Removing old tiles can be one of the most frustrating DIY tasks to carry out around the home. The older the tiles, and the more adhesive the backing, the harder it will be to remove them from the wall or surface without compromising either the surface or the tile itself. But replacing old tiles can do such wonders for the look of your home that it’s definitely worth attempting this tricky task. Fresh tiles won’t just make your home look cleaner and neater, they’ll also help to make it look more inviting. 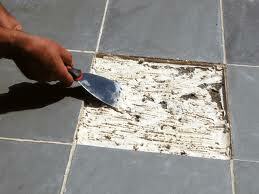 To remove old tiles, you should start by covering up all nearby surfaces. To remove the tiles, begin by hammering the chisel under the first tile then work across the wall in a horizontal line. Don’t worry if the tiles come off in pieces – they’re old, so you don’t need to protect them from breaking. Next, use the scraper to scrape the old grout and adhesive from the surface or wall. Chip away any loose plaster and use your plaster filler to repair the damage. If the surface has become too damaged you may wish to consider replacing it entirely. If you just want to replace a single tile, without compromising the rest, you can do so by using your drill to drill three holes vertically across the tile in question. Make sure the holes are close together as this will help you to break the tile up using your chisel and hammer. Work carefully and slowly. Rushing will only make it more likely that you will break the surrounding tiles. Replacing tiles is a much easier task than removing them. All you need to do is spread some adhesive onto the back of your new tile or tiles, then carefully affix them to the wall and re-grout once they’re firmly secured.